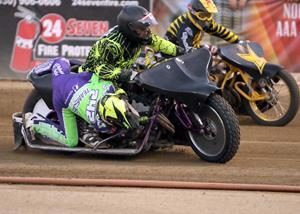 The season may be winding down at the Fast Friday’s Motorcycle Speedway but there is still plenty of fast racing action at the Gold Country Fairgrounds in Auburn, Ca. Racing on Saturday nights for the rest of the season, last Saturday night the Extreme Sidecars returned for their final visit of the season. 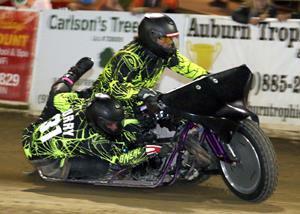 Making five appearances this year the sidecars again thrilled their strong fan base in Auburn. 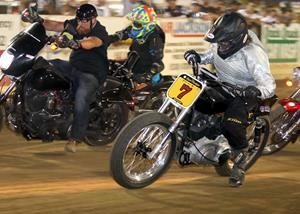 Saturday night was also the last night for riders to accumulate point’s leading to the track championships on Saturday September 22 when the top 16 Division I riders and top eight Division II and Division III riders will enter into the Fast Fridays Track Championships. Division points totals can be found on the Fast Friday’s website, fastfridays.com. The Curry sidecar team, Robert and Lori, won the sidecar main event. Coming back from a serious crash on August 3 and winning all their heat races except one, the Curry’s then took the main event with strong starts and staying just ahead of the team of Bryan Motis and Eric Hernandez who finished second. 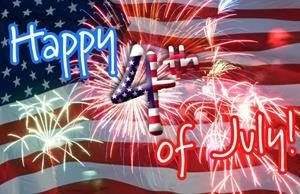 The team of Smylie Kinne and Brenda Hamilton were third and the team of Jeremy Gelein and Chuck Heider were fourth. “It only took all year long to win one, we made gearing changes, tire changes, rim changes, a bunch of different things from the last time we crashed here,” said Robert Curry. Eric Hernandez will have to find a new racing partner because Bryan Motis announced that this meeting would be his last. 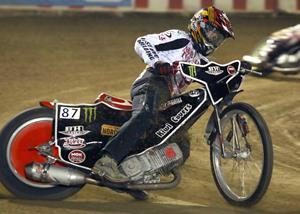 Motis’, a strong competitor on the sidecar circuit with a career that has spanned fifteen years; decided it was time to hang it up. 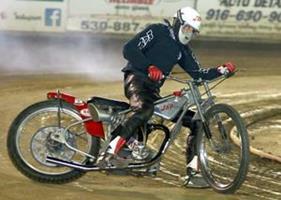 Among his many sidecar accomplishments, the Garden Grove resident won the 2014 Sidecar National Championship. Motis will be missed at Fast Fridays. 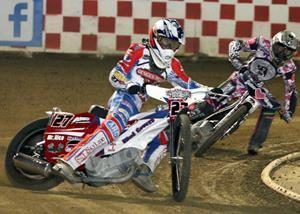 In the scratch main event Bart Bast increased his season wins to four with a great finale race. Bast who drew the inside lane faced Bryan Yarrow in lane two, Billy Janniro in lane three and Charlie Venegas was on the outside in four. Bast got a good gate and was inside in turn one, Janniro swung wide on the first turn losing ground and allowing Yarrow drop into second and challenge Bast. Yarrow gave chase but Bast just increased his lead a little with each lap, Yarrow unable to overtake him finished second. Janniro was third and Venegas fourth. In the handicap main event Blake Borello again topped the field. For Borello, who started the season riding off the 10 yard line, this was his fifth season handicap main event this time off the 40 yard line. Bart Bast was second, Ryan Bast was third and Billy Janniro was fourth. 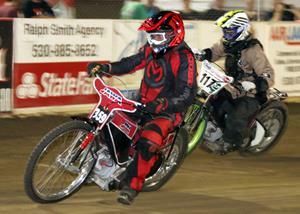 Davey Shaw was back on the winner’s podium in Division II with a repeating of his win on August 17. Shaw won his heat race to transfer to the main event making his night perfect off the 40 yard line. Aaron Sorani was second and Matt King was third. 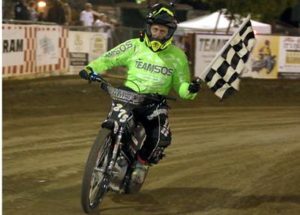 Anthony Dion, after completing a recent evening in the Billy Hamill Speedway School, captured the Youth 250cc main event. Dion survived a crash between Dylan Wagner and Kyle Cunningham then crashed himself on the restart, and with a loaner bike from his brother Timmy Dion took the lead from Cameron Krezman for the checkered flag on the third restart. Krezman was second and Cunningham was third. Landon Norton was the winner in the Youth 250cc consolation event. 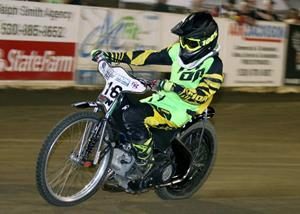 Colton Nelson again was on fire in the Youth 150cc main event. 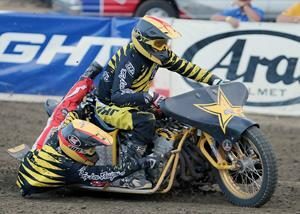 Nelson repeated his August 17 win and has now won four Youth 150cc main event wins, with two back to back. Nick Hohlbein was second and Kaytie Kangas was third. The remaining three Fast Friday’s races will all be on Saturday night’s beginning on September 22 with the track championships. 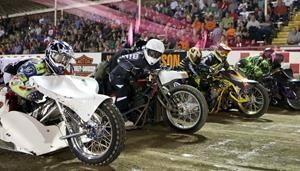 Saturday September 29 is the AMA National Speedway Championship and the season closes with the USA vs. The World on Saturday October 13. Bart Bast picked up his fourth scratch main event of the 2018 season. -Blake Borello won the handicap main event, his fourth of the season. Auburn’s Colton Nelson won back to back Youth 150cc main events. The sidecar team of Robert and Lori Curry won the sidecar main event, their first of the season. For the first time in his racing career, LC Veale won the Division III main event. The start of the sidecar start main event. 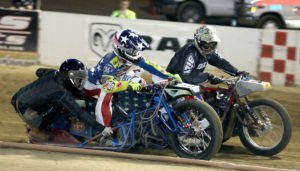 The team of Robert and Lori Curry (far right) won the sidecar finale. Anthony Dion won the Youth 250cc main event.